The arrival of PM Najib and CM Taib at this constituency of Rohani Karim, Deputy Minister for Domestic Trade, Cooperatives and Consumerism is a morale-booster for this 5 term MP. She has been under intense attack and scrutiny from saboteurs who have been lobbying to replace her. 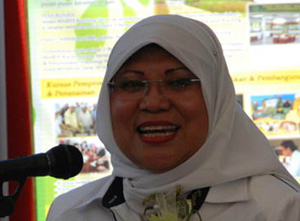 Rohani Karim has the ears and support when it comes from her President and Chief Minister of Sarawak Taib Mahmud. Her track record is exemplary. The only time she did suffered a scare was in 1999 where she was closely matched. Going into GE13 P201 will be a safe seat for BN and rest assured PM and CM will know that they have a credible candidate in Rohani who always delivers what she promises. Below are the extracted speech from bernama. The people of Sarawak should give the highest mandate to the Barisan Nasional BN government under the leadership of Datuk Seri Najib Razak in the coming 13th general election Chief Minister Tan Sri Abdul Taib Mahmud said that by doing so they were showing their appreciation and gratitude to the prime minister for coming up with various development programmes and assistance for their benefit. He said this in his speech to welcome Najib when he arrived in Beladin a rural fishing and farming town about 60km from here for a brief visit today. He said the people would only be spoiling a good opportunity for a better life if they allowed the opposition to take over the government in the coming general election The chief minister said for instance in Beladin a national opposition leader had teamed up with a foreign non-governmental organisation to instigate the people to reject oil palm cultivation on peat soil.